At a recent meeting, the Middleton Area Optimist Club learned that partnerships can be the key to finding what services your community needs most. When the Middleton Gazette newspaper publisher and Optimist Club member Becky O'Meara brought her husband, Tim, with her to a meeting to discuss his role as chairman of the Greater Middleton Parks and Recreation District, the idea of movies in the park evolved. 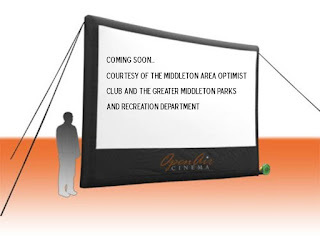 Twenty minutes later, a plan was conceived to raise the funds needed to purchase the equipment, including an outdoor screen, projector and PA system, and the Middleton Area Optimist Club was committed to staffing the event on an ongoing basis. It's a partnership that is still being developed and molded, but one that will bring the Optimist Club greater exposure in the community which they hope will lead to more projects and people that want to work together to do great things for the Middleton area. Already identified as potential assistants in the project are the area school students, including the Vision Charter School where a JOOI Club is being established. Since the partnership was announced earlier this month, two new members have joined. According to President Russ Nelson, finding a direction was an important step in the club's progress. "Without a clear purpose, we were losing interest. We're headed in the right direction now with a project that the community will enjoy, and a way to pay for it that will lead to more projects in the future," explained Nelson. He promised to share more information soon.